RNZ reports the leaders of two Tongan churches in Auckland have been in talks over which one will hold the funeral of the third person to die from a Christmas Eve bus crash near Gisborne. The bus was carrying 53 members and supporters on a fund-raising trip from Mailefihi Siu'ilikutapu College on Vava'u, Tonga, who had been heading to Gisborne's Wesleyan Methodist Church for a performance. Two passengers died when the bus crashed through a barrier in a remote area south of Gisborne. The group's leader, 55-year-old Leotisia Malakai, also died of her injuries on Sunday. 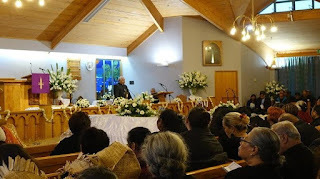 A memorial service for the first two casualties - 11-year-old Sione Taumololo and 33-year-old Talita Fifita, was held at Ponsonby's Tongan Methodist church on 29 December. But Tongan Advisory Council chair Melino Maka said that didn't follow protocol, because the college was part of the Free Wesleyan church and the Tongan Methodist church was just a sponsor of the trip. He said he hoped the funeral would be at the Free Wesleyan church, not the Tongan Methodist church. Photo: RNZ / Sarah Robson (A funeral service at Grey Lynn's Tongan Methodist Church for Sione Taumololo and Talita Fifita, who died in the crash on Christmas Eve).